When you see the SAS Service Configuration Utility (shown below) choose Create a Pool Service and click Next. 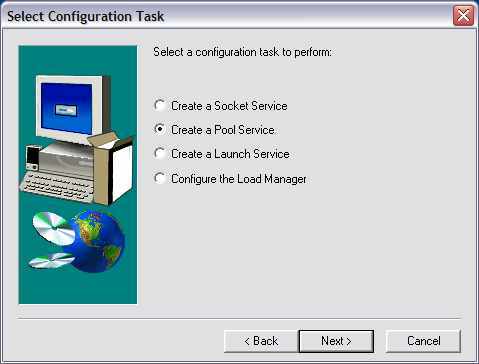 You may also choose to Create a Socket Service, however creating a Pool Service is suggested. Specify appdisp for the name of the service. When prompted to enter Enter Admin Password, you can leave it blank for this install on your local PC. The Configuration Utility will generate default Application Broker directives you need to add to your Application Broker configuration file. The Version 8 utility displays the information. You should save those values (e.g., cut-and-paste and save them as a text file). For Pool Services, make sure you save the value for the SasCommand Application Broker Directive.